The SCORE cloud for EpiCARE is now accessible to all EpiCARE ERN members. SCORE stands for Standardized Computer-based Organized Reporting of EEG. SCORE is a computer based system for EEG reporting and classification, where the physician can construct the report based on predefined terms and elements for each EEG feature as well as clinical phenomena. The electroencephalography (EEG) signal has a high complexity, and the process of extracting clinically relevant features has traditionally been achieved by visual inspection of the recordings and reports designed in free text format, which may lead misinterpretations and does not allow statistical comparisons. For this reason IFCN (International Federation of Clinical Neurophysiology) established a SCORE taskforce with the support of ILAE (International League Against Epilepsy) aimed to standardise EEG reporting. A cloud version of SCORE has been developed for EpiCARE. This platform will be used for projects related to EEGs, including inter-rater agreement studies, and systematic extraction of EEG features in patients with rare conditions. 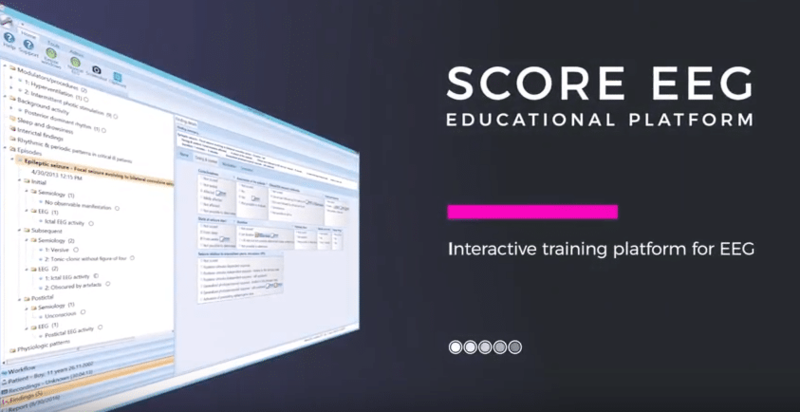 In addition, an interactive, web-based educational tool will be developed using SCORE. You can download the guide document from here with information about the SCORE system and the instructions on how to register and log in. You can find videos and webinars on how to use SCORE by visiting the Holberg EEG YouTube channel. To view the guidelines for EEG: SCORE, please click here.